The universal silicone adhesive wallet case quickly and easily attaches to the widest variety of mobile devices (iPhone 6/6S, iPhone 5/5S/5C, iPhone 4/4S, Samsung Galaxy, HTC, Fire, iPad, Kindle, etc.) as well as most cases. Constructed with durable silicone, metal snap chip inside & real 3M adhesive tape at back side, this wallet allows for maximum flexibility and security while keeping the slim, sleek shape of your device. It is multi-function as a card holder, mobile stand & earphone coiler. Portable, handy & easy to use. 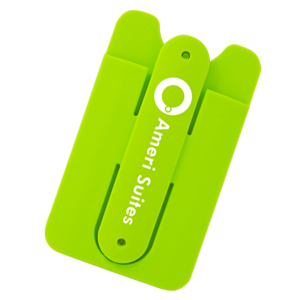 Easily attach or remove from smooth surface of mobile back and leaves no scratches or marks. Multiple existing colors optional, customer can also designated color by PMS color. No more bulky cases, no more having to carry around your bag or wallet, simply pick up your phone and go! Personalized color / printing can be achieved at MOQ 500 pcs.